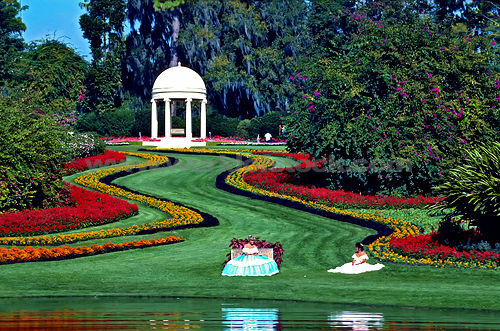 InSanity lurks Inside: Rumor Alert- Legoland to return parts of Cypress Gardens? Rumor Alert- Legoland to return parts of Cypress Gardens? Legoland Florida- Parts of Cypress Gardens to Return! While Legoland Florida hasn't yet confirmed, many fans of one of Florida original theme parks are finally given reason to rejoice. Orlando Sentinel is stating that this Wednesday Legoland will hold a ribbon cutting ceremony for reopening more parts of the iconic gardens. The Oriental Gardens and the "Florida Pool" which was made famous in the old movie "Easy to Love" will once again be open to the public. Rumor has floated around for a while now saying that previous owners of the park had removed the Florida-shaped pool and that the majority of the gardens where in ruins. A little quick searching on Google Maps has proved that false, the pool and it's iconic shape still stand- although not in the best condition in 2012 (when this google maps images seems to have been taken). This new bit of news seems to prove those rumors wrong. A good portion of the original "Cypress Gardens" area has been closed off to the public for years but it seems Legoland knows that history is important. Allowing more of the original gardens to thrive and be open is a historical treat for all ages. However, there is still no news on the remaining fate of other attractions which once made up "Cypress Gardens". More news on Wednesday/Thursday to see if this turns out to be truth!